Like all specialists, art historians have their own specialized vocabulary. That vocabulary consists of hundreds of words, but certain basic terms are indispensable for describing artworks and buildings of any time and place, and we use those terms throughout this book. They make up the essential vocabulary of formal analysis, the visual analysis of artistic form. Form refers to an object's shape and structure, either in two dimensions (for example, a figure painted on a canvas) or in three dimensions (such as a statue carved from a marble block). Two forms may take the same shape but may differ in their color, texture, and other qualities. Composition refers to how an artist organizes (composes) forms in an artwork, either by placing shapes on a flat surface or by arranging forms in space. To create art forms, artists shape materials (pigment, clay, marble, gold, and many more) with tools (pens, brushes, chisels, and so forth). Each of the materials and tools available has its own potentialities and limitations. Part of all artists' creative activity is to select the medium and instrument most suitable to the artists' purpose—or to pioneer the use of new media and tools, such as bronze and concrete in antiquity and cameras and computers in modern times. The processes artists employ, such as applying paint to canvas with a brush, and the distinctive, personal ways they handle materials constitute their technique. Form, material, and technique interrelate and are central to analyzing any work of art. Line is one of the most important elements defining an artwork's shape or form. A line can be understood as the path of a point moving in space, an invisible line of sight or a visual axis. But, more commonly, artists and architects make a line concrete by drawing (or chiseling) it on a plane, a flat and two-dimensional surface. A line may be very thin, wirelike, and delicate; it may be thick and heavy; or it may alternate quickly from broad to narrow, the strokes jagged or the outline broken. When a continuous line defines an object's outer shape, art historians call it a contour line. One can observe all of these line qualities in Durer's Four Horsemen of the Apocalypse. Contour lines define the basic shapes of clouds, human and animal limbs, and weapons. Within the forms, series of short broken lines create shadows and textures. An overall pattern of long parallel strokes suggests the dark sky on the frightening day when the world is about to end. Light reveals all colors. Light in the world of the painter and other artists differs from natural light. Natural light, or sunlight, is whole or additive light. As the sum of all the wavelengths composing the visible spectrum, it may be disassembled or fragmented into the individual colors of the spectral band. The painter's light in art—the light reflected from pigments and objects — is subtractive light. Paint pigments produce their individual colors by reflecting a segment of the spectrum while absorbing all the rest. Green pigment, for example, subtracts or absorbs all the light in the spectrum except that seen as green, which it reflects to the eyes. Hue is the property giving a color its name. Although the spectrum colors merge into each other, artists usually conceive of their hues as distinct from one another. Color has two basic variables—the apparent amount of light reflected and the apparent purity. A change in one must produce a change in the other. Some terms for these variables are value or tonality (the degree of lightness or darkness) and intensity or saturation (the purity of a color, its brightness or dullness). 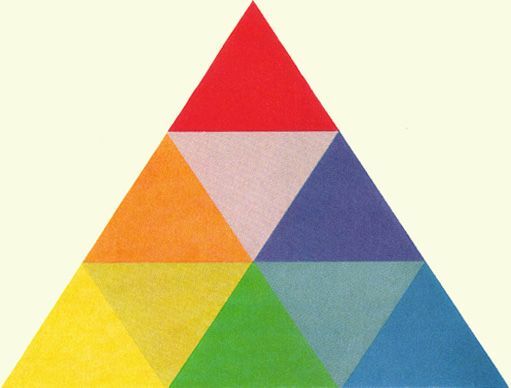 The color triangle Josef Albers and Sewell Sillman developed clearly shows the relationships among the six main colors. Red, yellow, and blue, the primary colors, are the vertexes of the large triangle. Orange, green, and purple, the secondary colors resulting from mixing pairs of primaries, lie between them. Colors opposite each other in the spectrum—red and green, purple and yellow, and orange and blue here — are complementary colors. They "complement," or complete, each other, one absorbing colors the other reflects. When painters mix complementaries in the right proportions, a neutral tone or gray (theoretically, black) results. Texture is the quality of a surface (such as rough or shiny) that light reveals. Art historians distinguish between actual texture, or the tactile quality of the surface, and represented texture, as when painters depict an object as having a certain texture, even though the pigment is the actual texture. Sometimes artists combine different materials of different textures on a single surface, juxtaposing paint with pieces of wood, newspaper, fabric, and so forth. Art historians refer to this mixed-media technique as collage. Texture is, of course, a key determinant of any sculpture's character. People's first impulse is usually to handle a piece of sculpture—even though museum signs often warn "Do not touch!" Sculptors plan for this natural human response, using surfaces varying in texture from rugged coarseness to polished smoothness. Textures are often intrinsic to a material, influencing the type of stone, wood, plastic, clay, or metal sculptors select. Space is the bounded or boundless "container" of objects. For art historians, space can be actual, the three-dimensional space occupied by a statue or a vase or contained within a room or courtyard. Or it can be illusionistic, as when painters depict an image (or illusion) of the three-dimensional spatial world on a two-dimensional surface. Mass and volume describe three-dimensional space. In both architecture and sculpture, mass is the bulk, density, and weight of matter in space. Yet the mass need not be solid. It can be the exterior form of enclosed space. "Mass" can apply to a solid Egyptian pyramid or wooden statue, to a church, synagogue, or mosque—architectural shells enclosing sometimes vast spaces — and to a hollow metal statue or baked clay pot. Volume is the space that mass organizes, divides, or encloses. It may be a building's interior spaces, the intervals between a structure's masses, or the amount of space occupied by three-dimensional objects such as sculpture, pottery, or furniture. Volume and mass describe both the exterior and interior forms of a work of art—the forms of the matter of which it is composed and the spaces immediately around the work and interacting with it. Perspective is one of the most important pictorial devices for organizing forms in space. Throughout history, artists have used various types of perspective to create an illusion of depth or space on a two-dimensional surface. The French painter Claude Lorrain employed several perspectival devices in Embarkation of the Queen of Sheba, a painting of a biblical episode set in a 17th-century European harbor with a Roman ruin in the left foreground. For example, the figures and boats on the shoreline are much larger than those in the distance. Decreasing the size of an object makes it appear farther away from viewers. Also, the top and bottom of the port building at the painting's right side are not parallel horizontal lines, as they are in an actual building. Instead, the lines converge beyond the structure, leading viewers' eyes toward the hazy, indistinct sun on the horizon. These perspectival devices—the reduction of figure size, the convergence of diagonal lines, and the blurring of distant forms—have been familiar features of Western art since the ancient Greeks. But it is important to note at the outset that all kinds of perspective are only pictorial conventions, even when one or more types of perspective may be so common in a given culture that they are accepted as "natural" or as "true" means of representing the natural world.